Whether you’re looking for a long distance or local moving company in Arlington VA, give My Guys Moving a call. Few things are more stressful than a move, but finding the right moving company in Arlington, Virginia can go a long way in alleviating the pain. Whether you're moving to a new location within town or relocating to a new state altogether, anything to make the move less stressful is worth its weight in gold. Need local movers or long distance movers in Arlington, Va? Have Your Guys Call My Guys! We have professionally trained employees: A move is more than just transporting your belongings from one location to another. It's about getting your items there safe and sound. We want your possessions to arrive in the same condition that they were in before we moved them. We care for your home: A professional move is more than just getting things from one place to another – it's about keeping the home you're leaving (and the home you're moving to) in excellent condition. We protect the building by using special padding and runners. We use proven techniques to protect your items: We use materials like stretch wrap and thick blankets to cover anything from couches to dressers. And custom crates can be built for valuables that need extra protection. We Also Do Commercial Moves! Do you own a small business or work for a large corporation? Well, office moves – whether locally in Arlington or across the country – carry their own set of considerations. My Guys Moving has years of experience in commercial moving and offers customized services to provide a smooth relocation. For local business moves, we help with logistics, manage inventory, dissemble and reassemble furniture, and much more. For long distance business moves (or even international), we help develop a relocation plan that is customized to your specific needs. With your move coordinator, you can rest assured that an expert is handling all the details that can be easily overlooked. And our custom crating services ensures that items are in proper containers to best protect them during transit. Check out our commercial moving section for more information. What Does it Cost to Hire the Best Moving Company in Arlington? A move can be very affordable with the right options. We provide transparent billing with straightforward rates and no hidden fees. Get an estimate: We can provide an estimate over the phone. In cases where your home is larger than six rooms, we recommend having one of our relocation specialists perform a visual survey of your home to provide the best possible estimate. Determine which services you want to use: These factors can affect your price. Do you want us to do some or all of the packing? How many trucks and movers does your move require? Do you need moving boxes and supplies? The billing of the move: We charge hourly from the time we arrive at the origin to the time you tell us we're done at the destination. We round up to the nearest quarter hour, add the trip charge that covers the cost of getting us to and from the job, and that's how we calculate your final bill. Experience in the area: We've moved hundreds of people in Arlington. Whether you are moving in or out of Courthouse, Rosslyn, Clarendon, or Ballston, we have the expertise and knowledge of the area to ensure a smooth transition for you and your precious cargo. Our estimates are based on the time expected to move each room. Each home is unique and has its own challenges. Things like a lot of stairs or being unable to park the truck nearby will make the move take longer. If you're leaving Arlington, Virginia, My Guys can handle your interstate move and help you arrive at your new destination outside of the local region. As we load the truck, everything will get labeled and inventoried and, at the destination, the interstate driver inspects each room to make sure that everything was delivered and set up properly. This approach allows us to provide the best long distance moving company services, giving you the peace of mind that your long distance move will go as planned. Note that the charge for long distance moving is different than the one outlined above – rather than being time-based, it's based on weight. 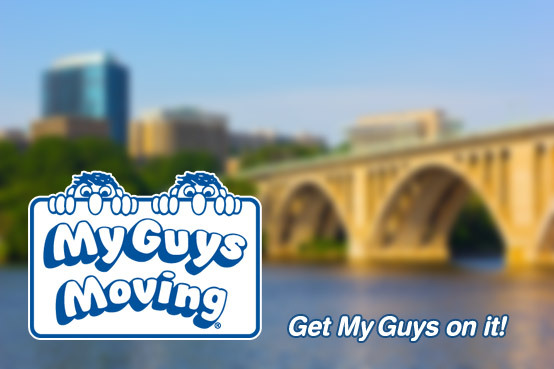 For full service moving to and from Arlington, VA, My Guys will get you moved out and moved in without stress. Our nationwide services receive high ratings, including an A+ from the Better Business Bureau. Check out the best moving companies reviews. best moving companies, best moving company, best national moving companies, best rated moving companies, best cross country moving companies, best long distance moving company, best moving companies reviews. Call 703-521-8700 or simply fill out the Free Moving Quote form on this page and One of the Guys will be right with you! Thanks for contacting MY GUYS!